Topics for both website and print publication should be related to orchids. Articles on orchid culture always rate highly with readers. 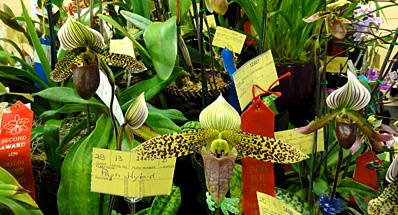 Orchidists are always anxious to learn new techniques, or gain insight into other growers’ successes. We welcome submissions about unusual species or color forms, or rare or rarely flowered orchids. If you have received recognition for a well-grown and flowered orchid, tell us how you grew it! We are especially pleased to receive major feature articles on a genus or a species and their hybrids or a breeding trend that will stand as a reference for many years for orchid growers who want to know more. For submissions to Orchids magazine: For a Style and Usage Guide for Orchids and its annual Supplement and for instructions for authors, or for information on the Dillon-Peterson contest, please return to the Article Submissions button to open the Style Guide. For Internet submissions: While the internet provides us with seemingly limitless opportunities for getting information, it is not always the most comfortable or relaxing experience. It is a lot different reading news from a computer screen than from sitting in your favorite chair with a magazine or newspaper: there is limited time and space to get your message across. Creating effective www content should be based on principles of conciseness. When in doubt, leave it out. Short sentences really work best, so please try to avoid long, rambling compound sentences with lots of extra words that seem to go on forever and ever and rarely, if ever, make any significant or noteworthy point. Like that one. Short sentences are best. Use the "first screen" (text in the first paragraph) to state what is to follow and get readers hooked on your message before they have to scroll to read more. Use photos with descriptive captions to communicate concepts quickly. Photos may be submitted as jpeg files with minimum size of 600x800 pixels (for web only). External links to additional reference may be used to supplement an article. Please do not send other people's copyrighted text or photos. Send your submissions to jean.ikeson@gmail.com or rmchatton@aos.org as well as any questions regarding suitability of content for either the web or Orchids magazine.